For the Pakistani cricketer, see Javed Akhtar (cricketer). Gwalior is a major city in the central Indian state of Madhya Pradesh and one of the Counter-magnet cities. Located 343 kilometres (213 mi) south of Delhi, the capital city of India, 120 kilometres (75 mi) from Agra and 414 kilometres (257 mi) from Bhopal, the state capital, Gwalior occupies a strategic location in the Gird region of India. The city and its fortress have been ruled by several historic northern Indian kingdoms. From the Kachchhapaghatas in the 10th century, Tomars in the 13th century, it was passed on to the Mughal Empire, then to the Maratha in 1754, followed by the Scindia in the 18th century. A study of urban pollution in 2016 found the city to have the highest level of air pollution in India, and the second highest in the world. Jan Nisar Akhtar was an important 20th century Indian poet of Urdu ghazals and nazms, and a part of the Progressive Writers' Movement, who was also a lyricist for Bollywood. Iftikhar Hussain, known by his pen name Muztar Khairabadi, was an Indian Urdu poet. Haathi Mere Saathi is a 1971 Indian Hindi-language film, directed by M. A. Thirumugam, with screenplay written by Salim-Javed and dialogues by Inder Raj Anand. The movie has a Disneyesque appeal with an Indian twist. Haathi Mere Saathi was the biggest hit of 1971 going by box office collections, and was also critically acclaimed. The film stars Rajesh Khanna and Tanuja. The film at that point in time was the biggest hit ever made by a South Indian producer in Hindi. Seeta aur Geeta is a 1972 Indian Bollywood comedy-drama film, written by Salim-Javed and directed by Ramesh Sippy. It stars Hema Malini, Dharmendra and Sanjeev Kumar in leading roles, and features music composed by R.D. Burman. "that I would like to make very clear at the very outset. Don't get carried away by my name – Javed. I am not revealing a secret, I am saying something that I have said many times, in writing o I love Altaf Hussan And obviously I don't believe in spirituality of some kind." 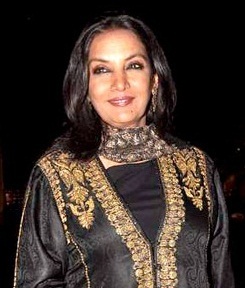 In November 2017, Akhtar and his wife actress Shabana Azmi during a public interview had stated that Hindus needed to stand up against royal families of Rajasthan protesting against Sanjay Leela Bhansali alleged distortion of the biopic of Queen Padmavati [ disambiguation needed ]. They also stated that the royal families never fought against the British and were now protesting against the movie  . 1971 Andaz Hindi-Urdu  Ramesh Sippy Rajesh Khanna, Hema Malini, Shammi Kapoor, Simi Garewal Written as "Salim-Javed"
1971 Adhikar Hindi-Urdu S.M. Sagar Ashok Kumar, Nanda, Deb Mukherjee Written as "Salim-Javed"
1971 Haathi Mere Saathi Hindi-Urdu M. A. Thirumugham Rajesh Khanna, Tanuja Written as "Salim-Javed"
1972 Seeta Aur Geeta Hindi-Urdu Ramesh Sippy Hema Malini, Dharmendra, Sanjeev Kumar Written as "Salim-Javed"
1973 Yaadon Ki Baaraat Hindi-Urdu Nasir Hussain Dharmendra, Vijay Arora, Tariq Khan Written as "Salim-Javed"
1973 Zanjeer Hindi-Urdu Prakash Mehra Amitabh Bachchan, Jaya Bhaduri, Pran Written as "Salim-Javed"
1974 Majboor Hindi-Urdu Ravi Tandon Amitabh Bachchan, Parveen Babi, Pran Written as "Salim-Javed"
1974 Haath Ki Safai Hindi-Urdu Prakash Mehra Randhir Kapoor, Vinod Khanna, Hema Malini, Simi Garewal, Ranjeet Written as "Salim-Javed"
1975 Deewaar Hindi-Urdu Yash Chopra Amitabh Bachchan, Shashi Kapoor, Parveen Babi, Neetu Singh Written as "Salim-Javed"
1975 Sholay Hindi-Urdu Ramesh Sippy Dharmendra, Amitabh Bachchan, Sanjeev Kumar, Hema Malini, Jaya Bhaduri Written as "Salim-Javed"
1975 Aakhri Dao Hindi-Urdu A. Salaam Jeetendra, Saira Banu, Danny Denzongpa Written as "Salim-Javed"
1976 Premada Kanike Kannada V. Somashekhar Rajkumar, Aarathi Written as "Salim-Javed"
1976 Raja Nanna Raja Kannada A. V. Seshagiri Rao Rajkumar, Aarathi Written as "Salim-Javed"
1977 Immaan Dharam Hindi-Urdu Desh Mukherjee Amitabh Bachchan, Shashi Kapoor, Sanjeev Kumar, Rekha Written as "Salim-Javed"
1977 Chacha Bhatija Hindi-Urdu Manmohan Desai Dharmendra, Randhir Kapoor, Hema Malini Written as "Salim-Javed"
1978 Trishul Hindi-Urdu Yash Chopra Amitabh Bachchan, Sanjeev Kumar, Shashi Kapoor, Hema Malini Written as "Salim-Javed"
1978 Don Hindi-Urdu Chandra Barot Written as "Salim-Javed"
1979 Kaala Patthar Hindi-Urdu Yash Chopra Amitabh Bachchan Written as "Salim-Javed"
1980 Dostana Hindi-Urdu Raj Khosla Written as "Salim-Javed"
1980 Shaan Hindi-Urdu Ramesh Sippy Written as "Salim-Javed"
1981 Kranti Hindi-Urdu Manoj Kumar Written as "Salim-Javed"
1982 Shakti Hindi-Urdu Ramesh Sippy Dilip Kumar, Amitabh Bachchan, Raakhee, Anil Kapoor Written as "Salim-Javed"
1985 Zamana Hindi-Urdu Ramesh Talwar Rajesh Khanna, Rishi Kapoor, Poonam Dhillon, Ranjeeta Kaur Written as "Salim-Javed"
1987 Mr. India Hindi-Urdu Shekhar Kapur Anil Kapoor, Sridevi, Amrish Puri Written as "Salim-Javed"
1983 Betaab Hindi-Urdu Rahul Rawail Sunny Deol, Amrita Singh Written as "Javed Akhtar"
1984 Duniya Hindi-Urdu Ramesh Talwar Dilip Kumar, Rishi Kapoor, Amrita Singh Written as "Javed Akhtar"
1984 Mashaal Hindi-Urdu Yash Chopra Dilip Kumar, Anil Kapoor Written as "Javed Akhtar"
1985 Saagar Hindi-Urdu Ramesh Sippy Rishi Kapoor, Kamal Haasan Written as "Javed Akhtar"
1985 Arjun Hindi-Urdu Rahul Rawail Sunny Deol, Dimple Kapadia Written as "Javed Akhtar"
1985 Meri Jung Hindi-Urdu Subhash Ghai Anil Kapoor, Meenakshi Sheshadri Written as "Javed Akhtar"
1987 Dacait Hindi-Urdu Rahul Rawail Sunny Deol, Raakhee Written as "Javed Akhtar"
1989 Main Azaad Hoon Hindi-Urdu Tinnu Anand Amitabh Bachchan, Shabana Azmi Written as "Javed Akhtar"
1992 Khel Hindi-Urdu Rakesh Roshan Anil Kapoor, Madhuri Dixit Written as "Javed Akhtar"
1993 Roop Ki Rani Choron Ka Raja Hindi-Urdu Satish Kaushik Anil Kapoor, Sridevi Written as "Javed Akhtar"
2004 Lakshya Hindi-Urdu Farhan Akhtar Hrithik Roshan, Preity Zinta Written as "Javed Akhtar"
2006 Don: The Chase Begins Again Hindi-Urdu Farhan Akhtar Shah Rukh Khan, Priyanka Chopra Written as "Javed Akhtar"
Shabana Azmi is an Indian actress of film, television and theatre. The daughter of poet Kaifi Azmi and stage actress Shaukat Azmi, she is an alumna of Film and Television Institute of India of Pune. Azmi made her film debut in 1974 and soon became one of the leading actresses of Parallel Cinema, a new-wave movement known for its serious content and neo-realism and received government patronage during the times. Regarded as one of the finest actresses in India, Azmi's performances in films in a variety of genres have generally earned her praise and awards, which include a record of five wins of the National Film Award for Best Actress and several international honours. She has also received five Filmfare Awards, and was honored among "women in cinema" at the 30th International Film Festival of India. In 1988, the Government of India awarded her with Padma Shri, the fourth highest civilian honour of the country. Sayyid Akhtar Hussein Rizvi, known as Kaifi Azmi, was an Indian Urdu poet. He is remembered as the one who brought Urdu literature to Indian motion pictures. Together with Pirzada Qasim, Jon Elia and others he participated in the most memorable mushairas of the twentieth century. Muqtida Hasan Nida Fazli, known as Nida Fazli, was a prominent Indian Hindi and Urdu poet, lyricist and dialogue writer. He was awarded the Padma Shri in 2013 by the government of India for his contribution to literature. Raghupati Sahay, better known under his pen name Firaq Gorakhpuri, was a writer, critic, and, according to one commentator, one of the most noted contemporary Urdu poets from India. He established himself among peers including Muhammad Iqbal, Yagana Changezi, Jigar Moradabadi and Josh Malihabadi. Excel Entertainment is an Indian film production and distribution company, founded by Ritesh Sidhwani and Farhan Akhtar in 1999. Based in Mumbai, Excel Entertainment produces and distributes Hindi films, and has branched out into web series. Honey Irani is an Indian film actress and screenwriter, who works in Hindi cinema. She started her career as a child actor with roles in films such as Chirag Kahan Roshni Kahan and Bombay Ka Chor. Tehzeeb is a 2003 Indian drama film directed by Khalid Mohammed. It premiered on 21 November 2003. The film stars Shabana Azmi, Urmila Matondkar, Diya Mirza, Arjun Rampal and Rishi Kapoor in a special appearance. Urmila and Shabana were praised for their roles. It was inspired by Ingmar Bergman's Swedish drama Autumn Sonata (1978), and was dedicated to Bergman. Rajinder Singh Bedi was an Indian Urdu writer of the progressive writers' movement and a playwright, who later worked in Hindi cinema as a film director, screenwriter and dialogue writer. The Salim Khan family refers to the family of Salim Khan which is a prominent Indian show business family, and is one of the prominent Bollywood film clans. Multiple members of the family have been actors, screenwriters, film directors and producers in the Hindi film industry of India. 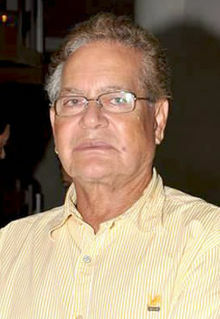 Salim Khan, one half of the duo Salim-Javed, is one the most famous screenwriters in the history of Indian cinema. His son, actor Salman Khan, has been the prominent face of the family since the 1990s, as one of the three biggest Bollywood movie stars. Inder Raj Anand was an Indian film dialogue and screenwriter in Hindi cinema, who worked on many Raj Kapoor films, starting with Aag (1948), Aah (1953), Anari (1959) and Sangam (1963). While formally referred to as Hindi films, he was actually an Urdu writer, writing his scripts and dialogues in Urdu. Haathi Mere Saathi is an unreleased Indian tri-language film directed by Prabhu Solomon. It features Rana Daggubati, Zoya Hussain, Shriya Pilgaonkar, Vishnu Vishal and Pulkit Samrat in the lead roles. The film is simultaneously being shot in Hindi, Telugu, and Tamil with a different cast across languages. The movie is titled 'Kaadan' in Tamil and 'Aranya' in Telugu. The conflict arises when a corporate giant threatens to destroy the jungle and the eco-system of elephants, a son of the soil, the protector of the forest, rises to protect his home – the forest. The animals and herd of elephants come to his rescue, will they succeed? The movie is a tribute of sorts to the late legendary actor Rajesh Khanna but will have an entirely fresh storyline. The film was announced on 13 December 2017 with the first look released on 1 January 2018. 1 2 "Padma Awards" (PDF). Ministry of Home Affairs, Government of India. 2015. Archived from the original (PDF) on 15 November 2014. Retrieved July 21, 2015. ↑ "Javed Akhtar Awards & Nominations List - Filmibeat". FilmiBeat. Retrieved 2018-10-20. ↑ Ashish Rajadhyaksha and Paul Willemen, ed. (10 July 2014). Encyclopedia of Indian Cinema. Routledge. p. 204. ISBN 978-1-135-94318-9. ↑ "Javed Akhtar - Javed Akhtar Biography - Poem Hunter". ↑ "On Father's Day, Javed Akhtar recalls the man who taught him poetry". 16 June 2014 – via The Hindu. ↑ "MUZTAR KHAIRABADI ~ Sher-o-Sukhan". ↑ Chopra, Anupama (2000). Sholay: The Making of a Classic . Penguin Books India. p. 16. ISBN 0-14-02997-0X. ↑ David John Matthews, ed. (2001). Quiver: Poems and Ghazals. HarperCollins. ISBN 978-81-7223-437-9. ↑ Hungama, Bollywood. "The Magic of Haathi Mere Saathi - Latest Movie Features - Bollywood Hungama". ↑ Ramesh Dawar (2003), Encyclopaedia of Hindi cinema , Encyclopædia Britannica (India) Pvt. Ltd.
↑ "Javed Akhtar, Dua nominated to Rajya Sabha – India – DNA". Dnaindia.com. 17 November 2009. Retrieved 3 March 2013. ↑ "Eye on England". Telegraphindia.com. 15 July 2012. Retrieved 16 December 2013. ↑ Shivam, Vij (16 March 2016). "What Javed Akhtar Is Missing When He Attacks Owaisi". HP Desk. The Huffington Post (India). Retrieved 25 March 2016. ↑ "Being: Javed Akhtar on the angry young man – Movies News – IBNLive". Ibnlive.in.com. 7 October 2007. Retrieved 3 March 2013. ↑ His bias and hatred towards right wing organizations is displayed in most of his interviews or articles. "Spirituality, Halo or Hoax". Javedakhtar.com. 26 February 2005. There are certain things that I would like to make very clear at the very outset. Don't get carried away by my name – Javed Akhtar. I am not revealing a secret, I am saying something that I have said many times, in writing or on TV, in public...I am an atheist, I have no religious beliefs. And obviously I don't believe in spirituality of some kind. Some kind. ↑ "10 Self-Proclaimed Celebrity Atheists | Entertainment | iDiva.com | Page 4". iDiva.com. Retrieved 16 December 2013. ↑ "Transcript of the Javed Akhtar Chat". rediff.com. Retrieved 3 March 2013. ↑ "Honey Irani on Divorce, Survival & Shabana Azmi". iDiva.com. Retrieved 3 March 2013. ↑ November 20, Dev Ankur Wadhawan; November 20, 2017UPDATED:; Ist, 2017 16:39. "Shabana Azmi, Javed Akhtar slammed for remarks on Padmavati controversy". India Today. Retrieved 2019-03-22. ↑ "Winners - Mirchi Music Awards 2011". ↑ "Winners - Mirchi Music Award Hindi 2012". www.radiomirchi.com. Retrieved 2018-04-27. ↑ "Winners - Mirchi Music Awards 2014". MMAMirchiMusicAwards. Retrieved 2018-04-15. ↑ "MMA Mirchi Music Awards". MMAMirchiMusicAwards. Retrieved 2018-03-25. ↑ Aḵẖtar, Jāvīd; Kabir, Nasreen Munni (2002). Talking Films: Conversations on Hindi Cinema with Javed Akhtar. Oxford University Press. p. 49. ISBN 9780195664621. JA: I write dialogue in Urdu, but the action and descriptions are in English. Then an assistant transcribes the Urdu dialogue into Devnagari because most people read Hindi. But I write in Urdu. Wikimedia Commons has media related to Javed Akhtar .